After being spun, yarn was wound into standardized lengths called skeins. As the yarn was wound around the arms of this reel, gauges inside the reel's box ticked with each rotation and caused a metal indicator to turn around the face of the "clock," painted on the outside. In this way, lengths of yarn could be more easily measured. 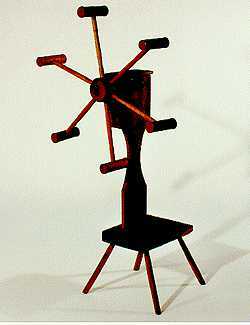 This yarn winder, like the spinning wheel, was owned by Mary Holt Bond of Marion County, Illinois.